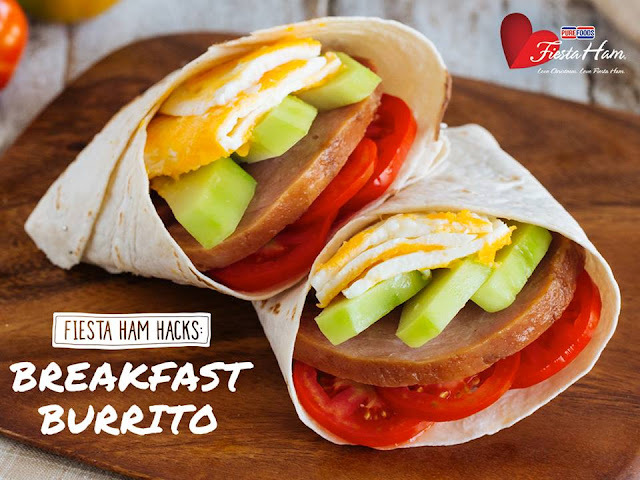 Make every breakfast meal feel awesome with our #LoveFiestaHam ultimate ham hack, the PUREFOODS FIESTA HAM® Breakfast Burrito! 1. Heat the oil in a pan on a medium heat. Cook the ham 1 minute on each side. Set aside. 2. On the same pan, cook the eggs sunny side up. Set aside. 3. On another pan, heat the flour tortilla, for 30 seconds on each side the brush one side of each tortilla with Magnolia Gold Butter. 4. Divide the ham, avocado, egg, tomatoes on each tortilla and assemble. Fold to enclose filling.